The sunset lighting around the downtown core of the City of Montreal in Quebec, Canada begins to fade as night takes over but not before the buildings leave their stunning reflections across the surface of the water. From the Bonsecours Basin in Old Montreal and Old Port, the scenery is beautiful at sunset as the lights become illuminated on the buildings and along the walkway to the marina. At the top of the ramp, a beautiful park like setting is located where people can enjoy a romantic walk at sunset and watch the night lights of downtown come to life. People mooring their boat at the marina can sit on deck and watch the reflections dance on the water. 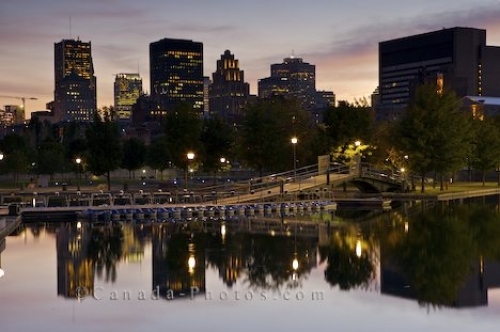 Picture of the reflections of the downtown buildings of Montreal, Quebec in Canada and the marina at sunset. ... , Quebec and tranquility such as this around the downtown area is one which should not be passed up. Downtown Montreal seen from the Bonsecours Basin in Old Montreal and Old Port at night, Montreal, Quebec, Canada.